U.S. Treasury imposes sanctions on Hizbullah leader Hassan Nasrallah and two other members, for their role in aiding the crackdown in Syria. 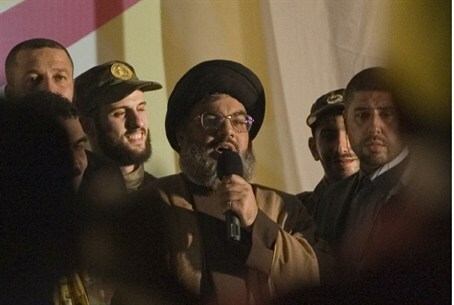 U.S. Treasury officials on Thursday imposed sanctions on Hizbullah leader Hassan Nasrallah and two other members of the organization, for their alleged role in aiding the Syrian government in its crackdown on opposition forces. The Wall Street Journal reported that the Treasury Department formally charged that Hizbullah has been supporting President Bashar al-Assad’s forces by providing training and logistical support. The Treasury also said Hizbullah has helped Damascus to monitor and control the movements of opposition fighters from the Free Syrian Army. “By aiding Assad’s violent campaign against the Syrian people and working to support a regime that will inevitably fall, Hizbullah’s ongoing activity undermines regional stability and poses a direct threat to Lebanon’s security,” Under Secretary for Terrorism and Financial Intelligence David Cohen said in a statement quoted by the Wall Street Journal. “Hizbullah’s actions, overseen by Hassan Nasrallah and executed by Mustafa Badr Al-Din and Talal Hamiyah, clearly reveal its true nature as a terrorist and criminal organization,” Cohen added. The Treasury’s sanctions bar Americans from doing business with these three Hizbullah members and freeze any assets they might have in the U.S. The Wall Street Journal noted, however, that Hizbullah has long been on the U.S. terrorism list, so Thursday’s actions aren’t expected to have much material impact on the organization. Last week, Britain's Foreign Secretary William Hague urged the European Union to place the military branch of Hizbullah on its list of terrorist organizations. “I would like to see the EU designate and sanction the military wing of Hizbullah,” Hague said in response to a question on arriving for talks with his EU counterparts. Britain is one of few countries to have blacklisted either parts or all of Hizbullah. Israel has been pressing hard for the entire organization to be blacklisted since July’s terror attack against Israeli tourists in Burgas, Bulgaria. Following the attack, Foreign Minister Avigdor Lieberman asked European governments to place Hizbullah on their lists of terror organizations.